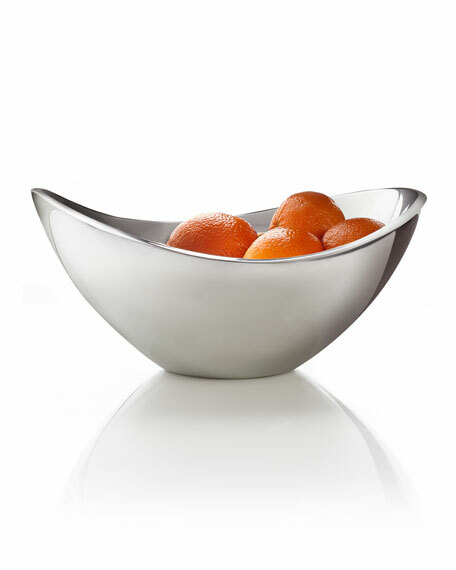 Bowl made of a lustrous metal alloy. Has the look of silver and the durability of iron but contains no silver, lead, or pewter. Christened for a tiny New Mexico village near Santa Fe, Nambe (nom-BAY) is known for simple, elegant designs that reflect its devotion to form as well as function. Nambe's unique, eight-metal alloy resembles silver yet never needs polishing; it retains heat and cold and can be used in the oven, refrigerator, freezer, or on the stovetop.